Everyone hopes to experience a full and healthy life ('Living Well') as they age and thereby, have a long life ('Living Long'). Wellness is a dynamic process that changes with age and is influenced by our genetics, lifestyle choices and habits and circumstance. Learning the current state of your true wellness improves your knowledge base, helps you set realistic goals and empowers you to make better choices for a longer and healthier life. My Goal: Give my patients a true and accurate picture of their actual physical wellness and an understanding of the role that testing for cholesterol, inflammation, plaque, metabolic and genetics play in heart disease, stroke, diabetes, inflammatory and auto-immune disease and cancer. Further, understanding the impact of nutrition, body weight, blood pressure, exercise, smoking, stress management with meditation, proper sleep and social relationships on an optimal quality of life provides the tools for a life of Living Well. With this knowledge I can provide my patients with a proactive lifestyle plan and continuing support that, if adapted, will have a dramatic effect on lowering their lifetime risks of preventable diseases and better insuring a true quality of life. Enjoy your journey as you scroll down my webpage, reading each of the articles. After watching this short and informative video, 'Just a Little Heart Attack', featuring Elizabeth Banks, review all the articles below and learn how your actual risk for heart disease, stroke or diabetes can be accurately assessed and managed. My Lifestyle Longevity Program is probably unlike any other you may have previously experienced. One major difference is that I have been utilizing Doppler vascular ultrasound to diagnose atherosclerosis (arterial plaque) for well over 20 years. I have measured the location, amount and type of plaque of the carotid arteries in the neck (risk for stroke) in over 2000 patients. Non-invasive vascular ultrasound can establish two important landmarks: (1) the actual presence of disease (plaque) and (2) if plaque is present, a baseline for future comparison. This simple office procedure provides the ability to classify a patient as more accurately being high risk (plaque) or low risk (no plaque) for a future heart attack or stroke. My goal: prevent Heart Attacks and Strokes by diagnosing plaque, stabilizing its progression and potentially reverse and eliminate it. The use of Doppler vascular ultrasound over time provides me an insight as to the effectiveness of a patient’s lifestyle changes and their medical treatment program. In other words: How a patient is really doing? Bottom Line: Heart Attacks and Strokes can be Prevented. 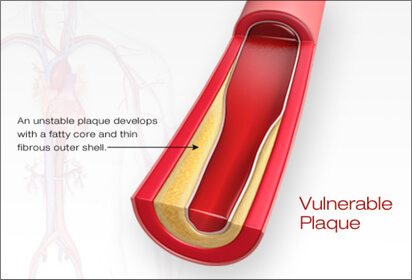 Plaque (atherosclerosis or hardening of the arteries) is an inflammatory disease that occurs in the wall of arteries (the vessels that carry blood and oxygen from the heart to the entire body). Plaque is the cause of nearly all heart attacks and strokes. Cholesterol is a type of lipid (fat) molecule that is that is necessary for life, because it is an essential structural component of all animal cell membranes. In addition to its importance for the body’s cell structure, cholesterol also serves as a precursor for the biosynthesis of steroid hormones, bile acid and vitamin D. However, being a fat molecule cholesterol does not mix with blood (water), as it would cause immediate clotting. Therefore, for cholesterol to reach all the body’s cells it must be transported by water-soluble molecules called lipo-proteins. Lipo-proteins come in many molecular sizes and it is the size of the molecule that determines how it is classified. There are five major classifications of lipo-proteins: HDL, LDL, IDL, VLDL and ULDL (chylomicrons). Within each class there are also many varying sizes. However, it is primarily two subclasses of LDL molecules that are responsible for the development and progression of plaque within the arterial wall: LDLp (particles) and sdLDL-C (small dense). When circulating blood levels of LDLp-C (cholesterol) and sdLDL-C (cholesterol) are elevated, they have the ability to permeate an area of inflammation within the lining of an artery and deposit cholesterol, creating a fat (lipid) pool called soft plaque. Think of plaque as a pimple-like structure that contains liquid fat (cholesterol). The capsule covering plaque may be thin (more susceptible to rupture) or thick (less susceptible). The body’s immune system can reverse the inflammation in the artery’s wall and deposit calcium making the plaque more stable (called ‘hard or calcified’ plaque). 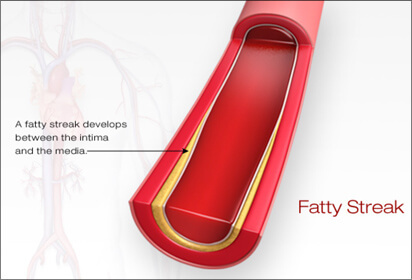 However, without warning, the thin capsule covering of plaque can rupture allowing the fatty cholesterol deposits to leak into the blood stream causing an immediate blood clot to form at the ruptured site. 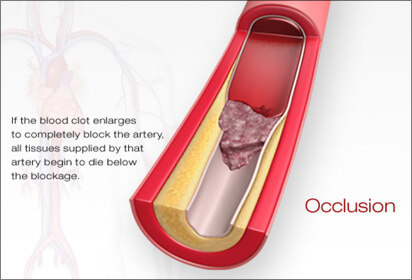 If the clot is large and closes off the entire artery, a heart attack or a stroke results and emergent medical attention is required to remove the clot, if possible. 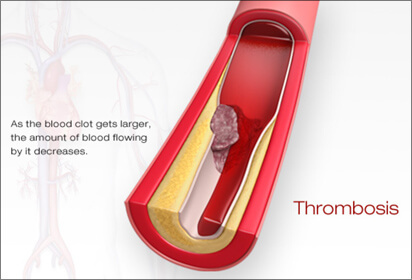 The size of the clot, its location within the artery and where it travels determines the severity of a stroke or heart attack, and whether or not it is fatal. Plaque can grow slowly, rapidly, or remain stable and never cause an event, unless it ruptures. What is now understood is plaque at any stage of narrowing (stenosis) can become unstable and the capsule can break or rupture. 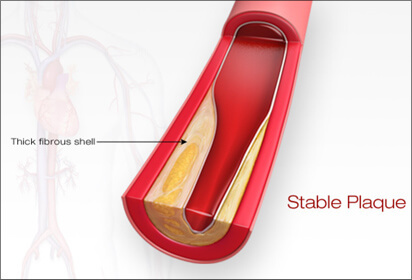 In other words, it is NOT the plaque building up and clogging the arterial pipe that is the cause of a heart attack of stroke; it is the rupture of the plaque capsule. Often it is an area of only mild soft plaque that ruptures and without warning. The good news is that atherosclerosis (plaque) formation is potentially reversible and even preventable! The KEY: identifying those patients who do not know they have disease (plaque) BEFORE they ever have a cardio-vascular (C-V) event and enrolling all persons who are at risk in a comprehensive prevention program. Remember: the majority of heart attacks and strokes occur in individuals with only mild plaque in their arteries and have have a normal cholesterol panel. My cardiovascular and diabetes risk prevention recommendations are based on a patients’ actual or measured risk. Risk classifications have been created by various heart associations and are an educated guess based on personal and family health histories and a basic cholesterol panel. Personal risk factors include age, current smoker, high blood pressure, waist measurement, diabetes, low HDL-C, high LDL-C, high triglyceride. Family history of early heart attacks and stroke and genetics are known risks. High-Risk includes anyone that has had a prior heart attack or stroke or meets certain calculated criteria. Low-Risk patients frequently have ’normal’ cholesterol levels and no risk factors. Yet low-risk people still have heart attacks and strokes. How many times have you heard about someone who is the epitome of ‘good’ health, exercises regularly, eats right, doesn’t smoke, etc. and has a sudden heart attack. How can that happen? 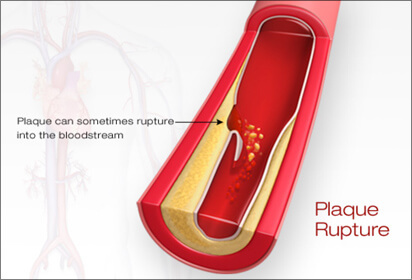 Answer: previously unknown and untreated plaque in an artery suddenly ruptures without warning. Recommendations for reducing future risk of a heart attack or stroke are generally referred to as either Primary or Secondary. Secondary Prevention (after surviving an event) recommendations are for high-risk patients and are generally treated more aggressively. Primary Prevention is recommended for low-risk patients and are generally less ‘aggressive’. All patients, however, are encouraged to eat healthy, lose weight (if not at an optimal BMI), exercise regularly, not to smoke, monitor their blood pressure and learn to manage stress with mindful meditation. All these risk factors (except genetics) can be successfully modified to reduce risk, if and when education, motivation, lifestyle planning and coaching are provided. The problem with this dual standard of care is the fact that nearly 50% of patients who have their first heart attack or stoke are in the low risk category. Plaque is NOT normal! 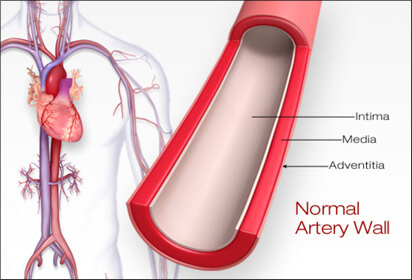 Patients who have been diagnosed with mild atherosclerosis (plaque) in their arteries on ultrasound scans are frequently told that ‘plaque is normal as they age’ and ‘not to worry’, unless it is causes a partial blockage of blood flow (to the brain or heart). Reports from mobile vascular ultrasound screening services actually state, “mild plaque is normal”. This ‘not to worry’ belief stems from the 1970's ‘clogged pipe mentality’ of cholesterol plaque buildup causing blockage of arteries as being the main cause of heart attacks and strokes. This belief led to the development of many vascular procedures over the past few decades, including angioplasty, bypass artery surgery and insertion of stents in the heart’s arteries or removing the plaque (endarterectomy) and insertion of stents in the carotid arteries supplying the brain. However, studies have clearly shown that while pain symptoms may be improved, these procedures have failed to lower the actual incidence of future heart attacks or strokes. I am currently affiliated with Boston Heart Diagnostics and have incorporated their 'Life-Plan' and Coaching Program into my recommendations for my patients. Over 1000 patients have enrolled in this program over the past six years and are reporting this program to be an amazingly educational and supportive. For many patients the program has been life changing. They frequently express the feeling of having greater control over the state of their health. They just feel better. The 'Life-Plan' Coaching Program has been critical in achieving their lifestyle goals. Nationwide, patients who have consulted with the Boston registered dietitian coaches have quadrupled their success rate. The coaching program is available for anyone, female or male, who has completed their initial laboratory testing and created his or her Life Plan (discussed below). 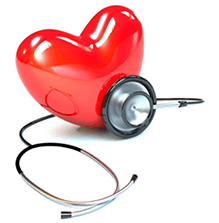 Cardiovascular disease is a group of medical conditions related to the heart or blood vessels. Hypertension (high blood pressure) and atherosclerosis (buildup of fatty deposits in the arteries) are two familiar types of cardiovascular disease. Some people, including healthcare providers, refer to cardiovascular disease as ”heart disease”, although it can affect more than just your heart. Cardiovascular disease can lead to more serious conditions, such as a heart attack, heart failure, or stroke. These ‘cardiovascular events’ can result in permanent disability or even death. Traditionally, the risk of cardiovascular disease has been determined by simple blood tests and the presence of various risk factors. One of the common ways’ healthcare providers screen for cardiovascular disease is with a blood test called a lipid panel. This panel is typically a combination of tests used to measure the amounts of fatty substances (called lipids) in the blood and can include: total cholesterol (TC), low-density lipoprotein cholesterol (LDL-C); high-density lipoprotein cholesterol (HDL-C); triglycerides (TG) and Non-HDL Cholesterol. LDL-Cholesterol (LDL-C), often called “bad cholesterol,” can build up in the walls of blood vessels supplying your heart and slow or block the flow of blood, increasing your risk of developing heart disease and possibly cause a heart attack. However, not all LDL is ‘bad’. It is the ‘small size’ particles and ‘small dense’ particles of LDL that deposit cholesterol in walls of arteries promoting the formation of plaque. Treatment, including drug and supplement therapy and lifestyle changes, is aimed at lowering small and small dense LDL-C particles and raising your large alpha HDL-C particles (see Boston Heart HDL Map Test discussed below). Information from traditional cholesterol screening tests provides basic screening information. But research indicates that lipid panel testing alone does not predict your risk of a cardio-vascular disease event. It is only the tip of the iceberg. Clinical trials have shown that lowering the total LDL cholesterol reduces the risk for a cardiovascular event by only 25-30% on average, meaning that standard therapy fails to address 75% of a patient’s remaining or residual risk for cardiovascular events. Additionally, hospital admission data indicates that at least half the people who’ve had a heart attack had “normal” cholesterol levels. This “silent killer” of 50% of patients who die suddenly from a heart attack had normal cholesterol. What is wrong with this picture? There is so much more information available to be learned about a patient that can correct this statistic. Read on. Boston Heart Diagnostics’ approach to cardiovascular disease risk assessment and treatment is different than any other laboratory. First, Boston Heart Diagnostics has developed two unique tests - the Boston Heart HDL Map and the Boston Heart Cholesterol Balance Test - to uncover specific and important information about your cholesterol that offers more insight than a standard lipid panel. These special tests, along with a panel of diagnostic and genetic tests, give me guidance to help you better understand your individual risk factors and to design a personalized program of recommendations that will help you prevent, manage and potentially reverse cardiovascular disease. Scientific advancements have revealed that HDL is comprised of many different sub-particles. Where standard HDL tests measures the total amount of HDL in your blood, the Boston Heart HDL Map measures the five sub-particles in HDL that range in size from very small to large. The amount that you have of each of these HDL sub-particles provides an indication of increased risk or protection of disease. HDL-C, the “good cholesterol,” helps remove LDL-C from your blood vessels. It carries this “bad cholesterol” to the liver, where it passes out of the body. 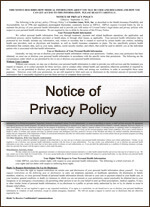 However, it is only the large alpha-1 and alpha-2 HDL particles that are protective. The smaller HDL particles are actually not healthy. If your basic lipid panel, which only measures the total cholesterol amounts, including HDL, is normal, the Boston Heart HDL Map Test can identify if you are at risk, enabling appropriate treatment. You want as much of the large alpha-1 and alpha-2 HDL protective particles as your body can produce. Each person produces and absorbs cholesterol at different rates. This can affect how your body reacts to certain therapies to lower your LDL or bad cholesterol and keep plaque from building up in your arteries. The Boston Heart Cholesterol Balance test is the only laboratory test that can identify and measure the balance between cholesterol production (from your liver) and absorption (from your intestines). This information provides me the ability to target the right dietary changes and cholesterol-lowering recommendations at the beginning of your treatment. The Boston Heart Lifestyle Program is different from others you might have seen or tried. With Boston Heart, you get personalized recommendations for improving your daily habits, which are linked to proven scientific research into how to improve heart health. Additionally, you get the support of trained, caring coaches, who are Registered Dietitians and will help you get going—and keep going—toward your goals. Boston Heart Diagnostic Report gives you new insights into your heart risks. Your Diagnostic Report is written in clear, easy-to-understand language, with colorful graphics that help you understand your risks and take action to improve your health. You can feel confident that you have the most in-depth information about the risks you face, as well as my scientifically tested recommendations for "getting to green" and moving from a high risk to a low risk lifestyle. 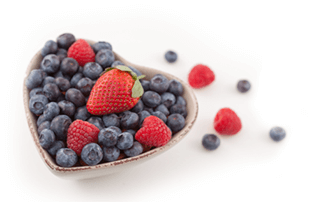 Boston Heart Personalized Nutritional Life combines personalized nutrition guidelines with dedicated coaching to help you adopt new habits to lower your heart risks and improve your health. 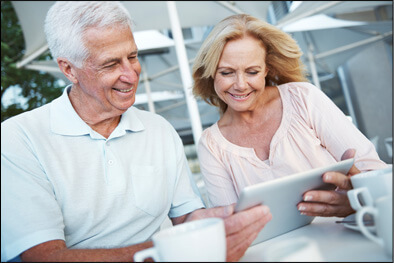 Your Life Plan is created when you create your own online personal Boston Heart Account. 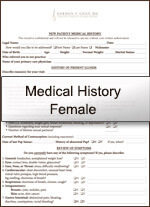 It includes all your lab results (found in your Diagnostic Report) and your answers to a brief questionnaire. Your Boston Heart Life Plan recommendations are based upon information and insights gained through extensive research and clinical successes in reversing disease combined with your own personal preferences. When followed, the goal is to move you “into the green” and to help you achieve your personal health goals. Your Boston Heart Life Plan also creates personal goals – for calories, food types and portions, and exercise based on your specific heart disease risks. It generates healthy menu plans – using an exclusive algorithm that formulates nutritional food options. Changing your eating and exercising habits can be a challenge. That's why the Boston Heart Lifestyle Program connects you directly with a coach, a specially trained Registered Dietitian (found by clicking on the My Coach icon within your personal account) who will hold you accountable and inspire you to follow through with healthier habits that can reduce your heart risk. You are also provided with easy-to-use, online resources to track your progress (called the ‘Lose-It’ Program’). You will have secure access to your Diagnostic Report, Life Plan and Lose-It Program for data entry and easy tracking - any time, any place. Completing our forms in advance of your visit allows Dr. Gunn to prepare and provides you and Dr. Gunn with more time to discuss your needs, health concerns and options for wellness. 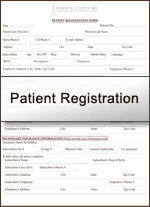 Please complete the forms and bring them to your scheduled appointment. I chose medicine as my professional career early in life. Inspired by my father, a respected obstetrician and gynecologist, I was eager to pursue the same career path. After earning my undergraduate education at both UCLA and USC, I received my medical degree from Baylor University College of Medicine in Houston, Texas. After completing my residency in Obstetrics and Gynecology at the UCLA Center for Health Sciences and City of Hope, I proudly served in the U.S. Air Force as the principle gynecology oncologist at Andrews Air Force Base in Washington, DC. During my tenure, I promoted the development of a new surgical technique that later became known as 'laparoscopy', a procedure that has revolutionized most surgical specialties today. After completing my Air Force tour of duty, I moved to Fullerton in 1971 to establish my private obstetrics and gynecology practice. In 1986, I stopped practicing obstetrics and focused on developing a center dedicated to gynecology and comprehensive evaluation and treatment of the many issues in women's health care. 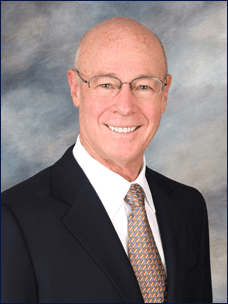 My goal was to create a warm and attractive environment, where both my philosophy and professional standard of medical care would continue to meet the changing needs of my patients. After the years of expansion of both the physical facilities, the medical care programs and the professional staff at the Gunn Towbin Center, I decided to return to the place where I began - solo practice. My interest in cardio-vascular disease dates back to college when I was first introduced to vascular research. In medical school I had the opportunity to train under the most prestigious cardiologists and vascular surgeons in the world. I continued to engage in vascular and cardiology research throughout my training. Over 25 years ago I introduced a wellness program to my patients. The program has grown and matured into a passion over these many years and continues to give me the privilege and opportunity to make a difference. I am certified by the American Board of Obstetrics and Gynecology and by the Accreditation Council for Gynecologic Endoscopy, Inc. and am a Fellow of the American College of Obstetricians/Gynecologists. I am also a member in a variety of professional organizations, including American Medical Association, American Association of Gynecologic Laparoscopists, Internal Federation of Gynecologic Endoscopists, American Urogynecology Association, International Continence Society and the National Lipid Association. I, and my wife, Andrea, have four grown children and four wonderful grandchildren. Together, we enjoy our health, our professions and the gifts that each day brings. 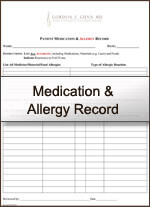 Are you a patient on record?